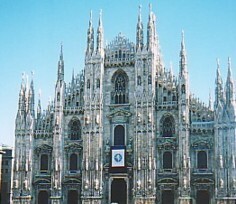 Milan is either Italy's second or first city, depending on who you ask. While Rome may be the administrative capital, Milan is the country's financial powerhouse, the home of Italy's stock exchange, at the heartland of the wealthy and productive north. In some ways, Milan has more in common with Paris or London than with other Italian cities. It's a business-like city with a work-hard, play-hard ethos. Rome may be the capital and the seat of government, but Milan is the business heart of Italy, the place where deals are made. The city has always been important, occupied by successive powers, and like most important cities it has been rebuilt many times. Consequently it lacks the medieval informal charm of other Italian towns, and is sometimes overlooked as a holiday destination. But in fact Milan has a lot to offer the visitor. The city is vibrant and has many sights of interest, as well as being a good jumping-off place for other North Italy destinations, such as Lake Como and the Alps. It's a good spot to spend a city break or a long weekend, or as the starting point for a two-centre holiday. Milan's designer clothes and furnishings are a major attraction for many fashion-conscious tourists, but not all Milan's pleasures are expensive. Sitting outside a cafe by the fantastic Duomo and admiring the well-dressed world go by, or indulging in a spot of window-shopping is enjoyable and rather more affordable. In Milan's museums and galleries are some great works of art, while more simple pleasures include climbing up to the Duomo's roof and enjoying the tranquillity and the view over the city to the mountains. The Brera and the Navigli (canal) districts are both appealing for evening strolls. Like most large cities, Milan has plenty to offer at any time of year. It's worth bearing in mind though that winters can be cold and misty, and summers very stuffy. There is a tourist information office (called APT) in Stazione Centrale, and another in Via Marconi, alongside the Duomo. They can supply you with a basic map (it's best to buy a more detailed one, however) and with lists of Milan museums and their opening times. Time Out are just about the best city guides. They are excellent guides to the places, restaurants, shops and bars that are off the main tourist trail. They also provide comprehensive information of the major sights, and help you get to grips with the real, living city. Lonely Planet guides always contain a wealth of background information and practical details. This one is ideal if you plan to see more of North-West Italy.